Panama’s dollar-based economy, developing economic region and strategic location in Latin America make it an attractive location for businesses looking to grow internationally. The Panama Canal and the Colon Free Zone mark Panama as the second largest trading port worldwide and a main trading partner for the United States (Doing Business in Panama, 2012). A current project aimed at expanding the Panama Canal, is estimated to be completed in 2015, and will support continued economic growth and encourage business development in upcoming years. An examination of environmental priorities, enacted regulations and corporate environmental practices are compared and contrasted with regional Panasonic Panama headquarters, and the United States’ Sony Corporation of America. Taking into account different stages of economic growth for each respective country provides insight into degrees of regulation and regional expectations of sustainability practices. Striving to maintain economic growth, and establish itself as a strategic business center, Panama must balance environmental regulatory policies with the need to support an attractive business environment. To obtain qualified data for each company and country, an extensive internet data collection process was followed. Information and data were collected from internet and database queries utilizing reputable government sites and national news sources. This Panasonic vs Sony Case Study case study solution explores the differences in environmental priorities between, Panasonic versus Sony, to provide a framework for developing dynamic company initiatives to support sustainability as a corporate social responsibility. A focus on local activities demonstrates company and employee engagement, as well as varying regional needs, and environmental concerns, for each country. Findings from this project reveal similarities in operational initiatives related to conserving resources, promoting sustainability and business process efficiencies. Primary differences involved a highly-regulated business environment in the U.S. versus Panama, as well as community-specific programs emphasizing restoration efforts by Sony Co. and educational initiatives by Panasonic. Impacts of the results from this research are beneficial for developing countries looking to implement environmental policies and for companies facing pressure to increase environmental activism. A balanced analysis of strategies employed by each company as well as governmental restrictions in each country reveal insights into international policy regulation, regional environmental awareness, and effective company processes for reducing the corporate environmental footprint. Corporate Social Responsibility (CSR) as defined by the World Business Council is, “the continuing commitment by businesses to behave ethically and to contribute to economic development while improving the quality of life of the workforce and their families, as well as of the local community and society at large” (“Corporate Social Responsibility”, 2003, para. 1). CSR plays a critical role in a company’s business polices as related to environmental practices. Corporate environmental responsibility outlines a company’s strategy for reducing its environmental footprint through energy savings, recycling initiatives, decreased CO2 emissions, and sustainability. Panama Panasonic and Sony Corporation of America, include corporate responsibility manifestos in annual review publications as well as part of their online web content, with varying degrees of environmental initiatives relative to each. Panama’s economy has seen rapid growth in recent years, with the last five years averaging 8.75% yearly increases in GDP (IMF, 2011). The current labor force boasts 1.509 million with an unemployment rate of 4.4% (see Graph 6). The majority of labor is concentrated in the service sector with 64.4% of the population working in services, largely provided by employment at the Panama Canal (The World Factbook, 2009). Fueling growth is the development of Panama’s infrastructure as an emerging country, specifically a project aimed at widening the Panama Canal which is expected to be completed in 2015. Despite economic growth Panama still suffers from massive income inequalities among its population, with 30% of the country living in poverty. In addition to income distribution, concerns about unstable politics also increases potential risks in the business environment. Panama’s logistics industry is its main source of GDP. The canal serves as a worldwide hub for trading and the presence of the Colon Free Zone mark Panama as a strategic business center. Recently the U.S. signed a ratified free trade agreement with Panama in October 2011, increasing U.S. import and export market share in Panama and reinforcing the importance of Panama as a critical trading partner for the United States. The widening of the canal is bringing additional business and increased opportunity to the area and is expected to lead to further economic growth and development in future years (Leach, 2011). The focus of this report is a case study of Panasonic vs. Sony corporate social responsibility in environmental practices. More specifically, this report compares environmental initiatives, regulations and impact of corporate social responsibility strategies for Sony Corporation of America and Panasonic Panama. Data collection for this study was obtained through extensive internet research. A face-to-face company interview in Panama was scheduled but canceled last minute and attempts to collect information via email were unsuccessful. Internet sources were leveraged to obtain needed information on environmental polices relative to each company and within each country. A secondary data collection was intended through direct interviews with Panama business executives at Panasonic headquarters. The main objective of the interview was to gain an understanding of what resources Panasonic employs in maintaining environmental compliance and what additional steps Panasonic is taking to reduce its environmental footprint locally. However, due to extenuating circumstances and scheduling conflicts, the interview was canceled last minute and case study findings were based on internet research alone. global initiatives mandated quick implementation of sustainability practices and ongoing efforts of corporate social responsibility in the public eye. Questions regarding internal processes used to roll-out the new initiatives, and how Panasonic monitored implementation and plans to support efforts going forward were meant to be addressed during an on-site meeting. Included below is a copy of the interview template prepared for the meeting. What were/are the main challenges faced in ensuring environmental compliance locally? What internal instruments are used to monitor environmental impact? Does Panasonic offer a “take back” consumer recycling program locally? What are specific steps Panasonic is taking during the next five years to reduce its environmental footprint? What do you feel will be the hardest challenge in maintaining Panama’s ecosystem despite rapid business development? Are any employee incentives offered to encourage environmental activism locally? What do you foresee as the biggest environmental hurtle to overcome in upcoming years? Unfortunately, the scheduled meeting with executive Mariana Samudio was canceled due to schedule conflictions so Panasonic company information obtained for this report was gathered exclusively from internet research. Situated just east of the Panama Canal on the South side of Panama, Panasonic Panama headquarters are located at Panasonic,Via Simon Bolivar, Ave Transistmica, Contigua Al, Panama City, Panama. Figure 3 below, depicts the Panasonic location within the country. Originating as “National Panasonic” in 1970 in the Republic of Panama, Panasonic’s first sales were recorded under the brand name “National,” and served local markets in Latin America. Early interest in Panama led this Japanese-based, multi-national corporation, to target goals in becoming the number one consumer electronics brand for Latin America. An aggressive market expansion was undertaken and soon Panasonic’s operating area expanded to include current markets of, Colombia, Ecuador, Uruguay, Paraguay, the Caribbean and other regions of Central America and Brazil (http://www.panasonic.com.pa/about/corporate/history/). Panasonic Panama serves as the central headquarters hub for all Latin American sales. North and South American sales for Panasonic represent 12% of the company worldwide total or $9.4 billion (966.5 billion yen at exchange rate 1USD:102.44JPY), with global sales of $76.9 billion (7,846 billion yen) in fiscal year ended March 31st, 2012 (Panasonic Corporation Annual Report, 2012). Products currently offered in Panama range from audio and video electronic equipment to lighting, communications and appliances. Sales and service focus on both direct to consumer sales as well as business to business relationships. Panasonic Panama takes an active role in supporting local ecosystem preservation and encouraging community activism. In addition to a global company-wide program, “Eco Ideas,” Panasonic also participates in regional events through volunteerism, sponsorship and fundraising. Recent contributions include “Panasonic Cares – Month of the Oceans,” an employee volunteer beach clean-up event, which resulted in the collection of 3.134 pounds of plastic waste gathered and recycled (http://www.panasonic.com.pa/about/eco/). In addition, local contributions to promote environmental awareness include, the establishment of “El Caucho,” an outdoor recreation and 390 meter trail, located in the middle of the city, construction of a visual education center dedicated to improving environmental awareness in the community, and ongoing ecosystem education materials for children which include an international contest to compete on the basis of eco conservation ideas. Business initiatives also seek direct impact through actively planting trees to maintain Panama’s ecology. During 2008, Panasonic’s “Project Relay Eco Ideas” resulted in over 1,000 trees planted along the Channel. Panasonic Panama uses a two-prong approach, both consumer-focused and business driven, consistent with their global green plan concept of “Green Life” innovation and “Green Business” innovation (Panasonic Sustainability Report, 2012). 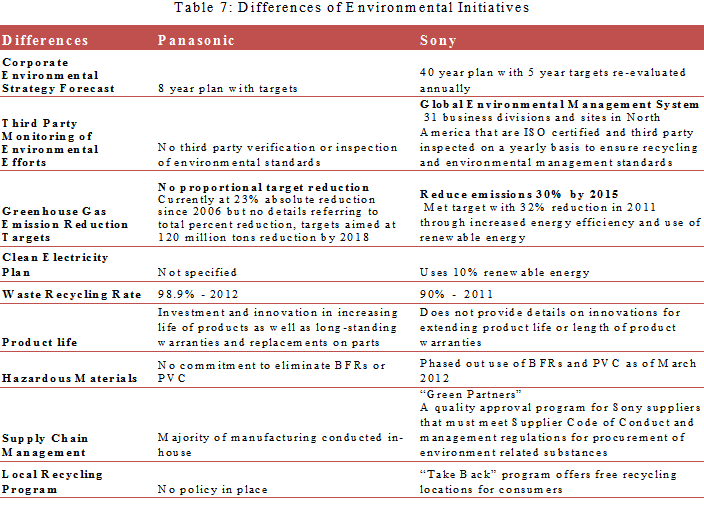 Active participation locally, ensures sustainability remains at the forefront of environmental initiatives, and investment in R&D allows further opportunity for Panasonic to tackle global eco challenges and promote green life not only operationally but throughout the life of the product and through consumer and business use, the below figure outlines Panasonic’s Green Plan strategy for 2018. 3.5 Overview and Characteristics of Sony Corporation. Sony is an international Japanese-based consumer and business electronics company, publically owned and traded on the New York Stock Exchange. Known for early sales success of transistor radios, Sony products now include a breadth of assortment from CD’s, computers, smartphones, and TV’s to professional broadcast and video equipment (www.sony.net). Several years of successfully exporting to the U.S. led Sony to establish offices in New York in 1960 and increasing demand prompted construction of a California production facility in 1970. The popularity of Sony’s color TV launched late in the sixties, coupled with growing U.S. market share called for faster turnaround and streamlined production of products, leading to the current San Diego production facility and distribution center which boasts 394,000 square feet of building space, over 1 million square feet of industrial space and 2,500 employees (Brass, 1996). U.S. Sony sales totaled $10.436 billion (1,064 billion yen at rate of 1USD:102.44JPY) for fiscal year 2012 and represent 16% of company worldwide sales reported at $66.658 billion (6,800 billion yen) for fiscal year ended March 31st, 2012 (Sony Annual Report, 2012). Sony sales are comprised of 50% consumer electronics, 30% professional products and 20% component parts to original equipment manufacturers (www.sony.net). 3.6 Sony Corporation Environmental Activities. In addition to Sony’s “Road to Zero” environmental corporate strategy, Sony also contributes to local communities through its Global Environmental Management System, employee volunteerism and community activism. Under the Global Environmental Management System, Sony operates 31 business divisions and sites in North America that are ISO (International Organization for Standardization) certified and third party inspected on a yearly basis to ensure recycling and environmental management standards are upheld at Sony manufacturing and nonmanufacturing sites. Locally in California, Sony has partnered with the University of California Santa Barbara, to provide funding, technology and equipment to students researching environmental projects and to benefit educational enrichment of the local community on sustainability issues. Funding to local non-profit events such as “I Love a Clean San Diego,” “Creek to Bay Cleanup,” “Kid’s Ocean Day,” and “California Coastal Cleanup Day,” support community activism and encourage company volunteerism. In 2012, a total of 359,000 pounds of waste were collected from volunteers with 93,000 pounds recycled (www.sony.net). One of Sony’s largest environmental programs is a nationwide “take-back recycling program.” Through the “take-back” program, consumers are able to return any Sony product for recycling at no charge at drop-off locations across the country (www.sony.net). Sony also sponsors a company-wide Global Volunteer Day, encouraging all employees to participate in local volunteer activities. Efforts in 2012 included transforming a neglected schoolyard park in Brooklyn into an interactive outdoor classroom, where Sony volunteers conducted sustainability workshops for neighborhood kids (www.sony.net). In Los Angeles, tree planting and neighborhood cleanups are an ongoing commitment for Sony employees. A history of environmental issues in California has led to eco-conscious residents and consumers, encouraging “green” products and sustainability initiatives for businesses. To this effect, Sony’s local activities focus on rebuilding and restoring through sponsorship, fundraising and volunteer efforts, as well as an internal focus on reducing supply chain environmental impact and increasing energy efficiency standards through initiatives and investment. 4.1 Comparison of Panasonic Panama and Sony Corporation. 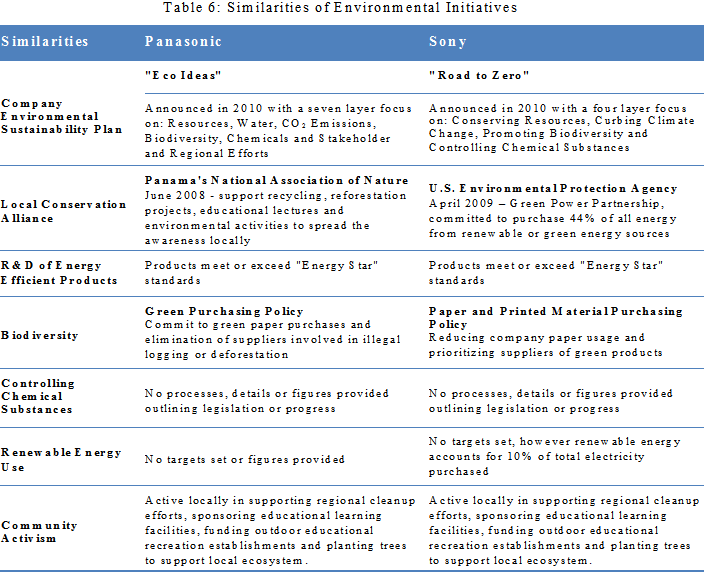 Aspects regarding environmental initiatives, targeted environmental goals, community activism and local impact of corporate processes for Panasonic Panama and Sony Corporation of America were compared to illustrate similarities and differences between the companies and the varying degrees of regulation employed by each country. Specific comparisons were drawn between the company’s operations, product development, and energy usage as well as detailed reviews of each company’s corporate environmental strategy plan and future targets. 4.2 Similarities between Panasonic Panama and Sony Corporation. Agency proves advantageous for ensuring increased green energy usage. Through the EPA’s Green Power Partnership, Sony has committed to purchase 44% of energy through renewable and green energy sources, leading to reduced CO2 emissions and lower overall carbon footprint (www.sony.net). In-house allocation of resources focuses on the development of energy efficient products as a priority for both companies. Through innovation and design initiatives, Panasonic Panama and Sony Corporation claim “Energy Star” ratings on all consumer goods products (Guide to Greener Electronics 18, 2012). Energy Star standards signify goods using 20%-30% less energy than required by federal standards (Tugend, 2008). In addition, regulation of paper purchase is enforced for both companies to ensure only reputable distributors, not involved in illegal logging or deforestation activities, are used for paper purchases. Regarding the control of chemical substances, both companies cite this as an initiative; however neither company provides figures relative to usage and disposal or specifics on how this is being addressed or controlled internally. According to Greenpeace Magazine, this is the biggest gap in each company’s execution of corporate environmental strategy plans (Guide to Greener Electronics 18, 2012). The similarities of these company initiatives are important because they illustrate, despite varying degrees of expectations by local communities, and differing levels of operational regulation in each country, company CSR policies often drive regional environmental awareness and impact. Based on research conducted, Sony Corporation is very likely to have long-term success, and overall a great investment. After going through a downturn, Sony handed of the reins to a new leader and now have a positive outlook. Market demand is increasing, while Sony is investing more and more money into research and development, and ultimately has Creativeness/Innovation as a key to their overall image. As you can see in the chart under the ‘Business Divisions’ tab, the video game market is the most profitable market among electronics, and the demand is continuously increasing. As a plus, the nature of the market and game sales guarantees long-term, frequent customers. Video games are a key business division right now Sony Corporation’s success will also come from their very strong concentration on Corporate Social Responsibility. Sony will prevail with these foundations because it will help them to grow and change with the diversification of the markets and customer’s lifestyles, innovation of products and services, and changing concerns of stakeholders. Sony believes this will enhance corporate value and benefit society. 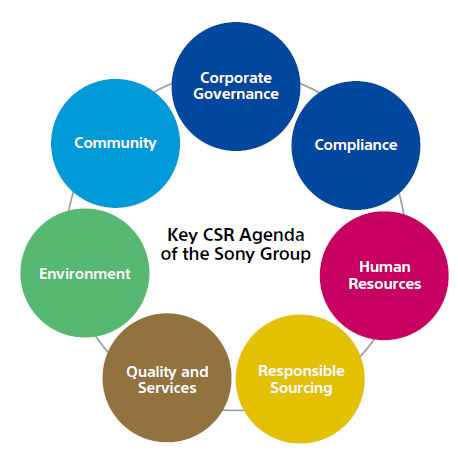 The Sony Group’s Seven Focus Areas on Corporate Social Responsibility can be found in the chart below. Sony is a larger company as compare to Panasonic. Panasonic need to improve its marketing tools.